Fraser Island: one of the best camping spots in south east Queensland – and Australia as a whole! Fraser Island is a bucket list destination for almost every camper. And that’s not just those in south east Queensland! The sheer beauty and uniqueness of Fraser Island makes it a prime destination for campers across the country. If you ever get the pleasure of going, the reasons why will be immediately apparent. As the largest sand island in the world, Fraser offers no shortage of stunning white sand beaches, and crystal blue oceans. Better still, those oceans are packed full of fish, whales, dolphins, turtles and more. What better reason to take your tinny and trailer for a test ride? You will need a reliable 4×4 though – that sand can get soft. Conondale National Park is position atop the Sunshine Coast hinterland, and it is a great weekend destination. In fact, as weekend options go, Conondale would have to be one of the best camping spots in south east Queensland. It offers beautiful lush forests, interwoven with clear forest streams. The roads are mostly dirt, but the going is quite easy. Nevertheless, it pays to bring a 4×4 so you can explore the nearby glasshouse mountains, and navigate any tricky terrain. Cape Palmerstone National Park is a bit of a hike from south east Queensland, but it is one of the best camping spots nonetheless! Sure, it may be a little more central east than south east, but you’re always south of somewhere, right? Cape Palmerstone warrants a mention on any list of Queensland’s best camping spots – south east or otherwise! 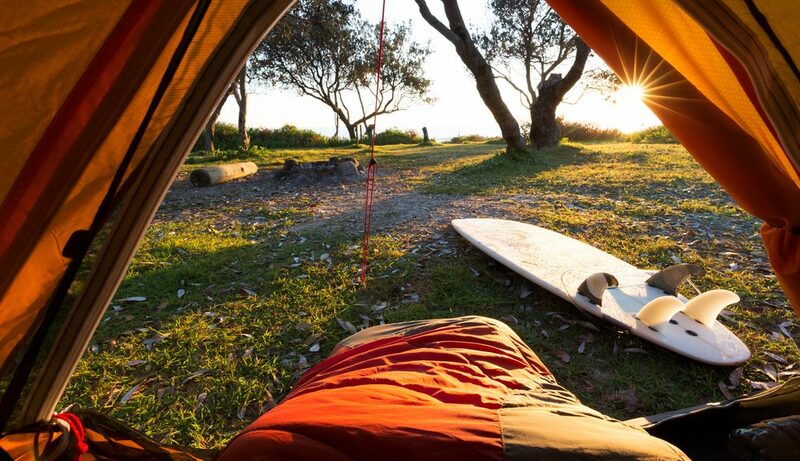 Located a few hours south of Mackay, Cape Palmerstone offers secluded beachfront camping. It isn’t too far from civilisation, but it sure feels like it, which makes its appeal that much greater. It also has a labyrinth of creeks and rocky headlands, so it’s well worth taking the tinny. You’ll need a sturdy and light trailer though, and a 4×4, as the track in can be rough. A little more on topic is Teewah Beach – a quintessentially south east Queensland beachfront national park. Located just north of Noosa, it offers 40km or so of pristine beach, stretching all the way to the southernmost point of Fraser Island. In fact, it offers a lot of Fraser’s benefits, but on the mainland. So reaching it is a little more affordable and straightforward. Nevertheless, once you’ve experienced Teewah we have no doubt Fraser will be next on your list. The best camping spots in south east Queensland aren’t all 4×4 exclusive. Lake Monduran is one of south east Queensland’s best spots to take it easy. That is, until you have a raging metre barra on the end of your line. That’s right – Lake Monduran is also one of Queensland’s premier impoundment barra fisheries. Easy to access, perfect for boating, and full of fat barra: sounds like camping heaven! To get your tinny to the toughest and best camping spots in south east Queensland, contact us!